Every summer my grandmother buys dozens of ears of corn from the local farms and spends an afternoon shucking and cutting the kernels off the cobs to freeze. Come winter, we pull out a bag of frozen corn from the freezer and have the sweetest, creamiest dish this side of Labor Day. She used to add sugar to the kernels before freezing, but after trial and error, found that the corn was sweet enough on its own. Just a few minutes in the microwave and a couple tablespoons of butter (a Southern cooking staple). With the corn that doesn’t make it to the freezer, my grandmother makes the most delicious corn fritters. There are two types of corn fritters in the south: the ones like fried dough balls and the ones like pancakes. My grandma always made the pancake kind with maple syrup and (more) butter. 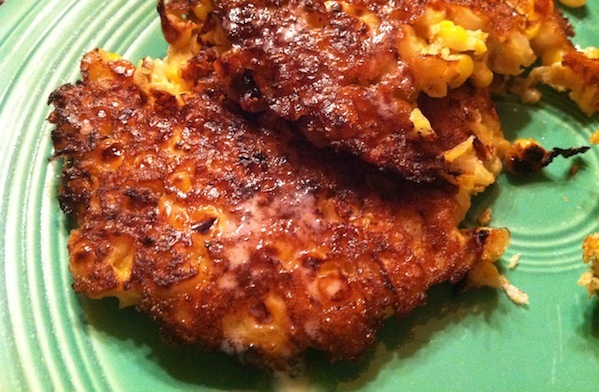 This recipe isn’t as good as my grandma’s–nothing will ever be–but I found a pretty good recipe for fritters that when fried in butter, taste almost as good. In a large bowl, mix the corn, flour, eggs, onions, salt, paprika, pepper and cayenne. In a large skillet, heat the oil and 1 tablespoon butter over medium heat until the butter has melted. Carefully drop some of the corn mixture by tablespoons in to the hot oil and flatten with the spoon, taking care not to crowd the pan. Cook each fritter until browned, about 2 to 3 minutes. Turn each fritter over and brown the other side, about 1 to 2 minutes. Remove the fritters to a platter lined with paper towels. Repeat until all of the corn mixture has been used. Serve with maple syrup. They are just yummy! As good as Memaw’s! Excellent article, too.